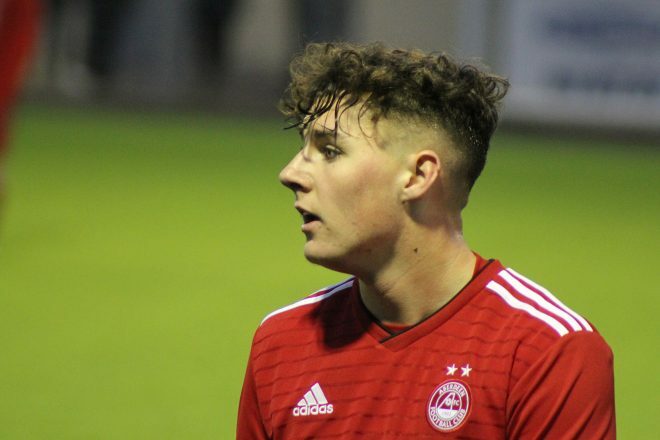 The Aberdeen youngsters went down to a narrow defeat this evening against Celtic. Despite some disappointing results in recent weeks, the Dons started the game extremely well. In the first 15 minutes they played with a good bit of confidence about them. They played some good football and pressed well against the ball. But then against the run of play Celtic took the lead. It came from an Aberdeen mistake, they gifted Celtic the ball in a dangerous area which allowed Dave McKay the chance to slot the ball past Archie Mair. From the visitors perspective, a cheap goal to lose. The goal seemed to knock the Dons out of their stride and Celtic grew in confidence. Stephen McManus’ side had been handed a lift but then dominated the rest of the half and were in command. Shortly before the interval they netted a second. Aberdeen lost possession in the Celtic half, and the home side broke after a long ball forward allowed Michael Sparkes the chance to get beyond Conor Power and then beat Mair with his shot. At half time Kieran Shanks (pictured) replaced Michael Dangana. Like the first forty five, Aberdeen started the half strongly and this time were rewarded for their efforts. Substitute Shanks got himself in a good position after a quick ball forward and then from an angle on the edge of the box he fired a fine shot past keeper Liam Hughes. Suddenly Celtic were looking nervy and Aberdeen got a lift. Playing with more aggression, Aberdeen pushed hard for an equaliser in what was a very even contest. The Dons built some good pressure at the end but they could not get the break of the ball in the penalty area and could not quite do enough. As Aberdeen pushed bodies forward, Celtic did have a couple of breaks and Mair, who is away with the Scotland 19s next week along with Dean Campbell, produced two fine saves. “I was very pleased with the start to the game. But after losing the goal, we needed to react better than we did. In the second half we were a lot better in terms of being a bit quicker and more aggressive with everything we done. With the ball and without it. “We won the second half 1-0 so that is something to build on going into the next game. “There is still a lot to play for. “We started with three 2003’s (U16 players Calvin Ramsey, Lyall Booth and Michael Dangana) and had more on the bench. We were quite a bit younger than Celtic but that is the way we are going to go between now and the end of the season. “We are going to blood these youngsters with one eye on who is coming in full time next year. We will see how they get on. We have to test them at this level and see how they respond.